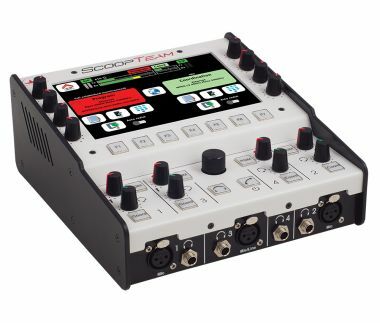 Perfect for live sport coverage, ScoopTeam is a commentary unit integrating a double mono codec for live transmission of one or two audio signals with high audio quality (up to 20 kHz bandwidth). Rich and versatile, ScoopTeam is designed to meet the simplest as well as the most complex needs. The unit can mix 4 XLR microphone inputs and up to 9 other audio sources on two channels. Both audio channels can be routed to a single destination (dual mono codec transmission), or two different destinations (dual codec). The stereo algorithms (MPEG Layer 2, AAC, Opus) allow to use ScoopTeam to transmit a stereo stream by mobilizing the coordination bus for mixing the right channel. The interface is intuitive, with backlit buttons and dedicated and assignable knobs for settings and volume control. The AETA Remote Access function allows you to access the settings of the device remotely from an Internet connection. In addition to its codec function, ScoopTeam can also be used as an intercom panel, thanks to its Ravenna AES67 interface (2 channels in, 2 channels out) and to its analogue and AES audio inputs/outputs. Thanks to its flexibility and its audio mixing and distribution capabilities, ScoopTeam can also be used as a light mobile studio on small installations.